The fast-growing ($46B in 2016) online gambling industry has a problem: TRANSPARENCY. In 2017 all online casinos have full power to cheat against their own players. They can do it easily, without being spotted. It is also difficult for the casino to prove when they are not cheating. This creates a massive problem for online gambling and casts a shadow on the industry’s reputation. 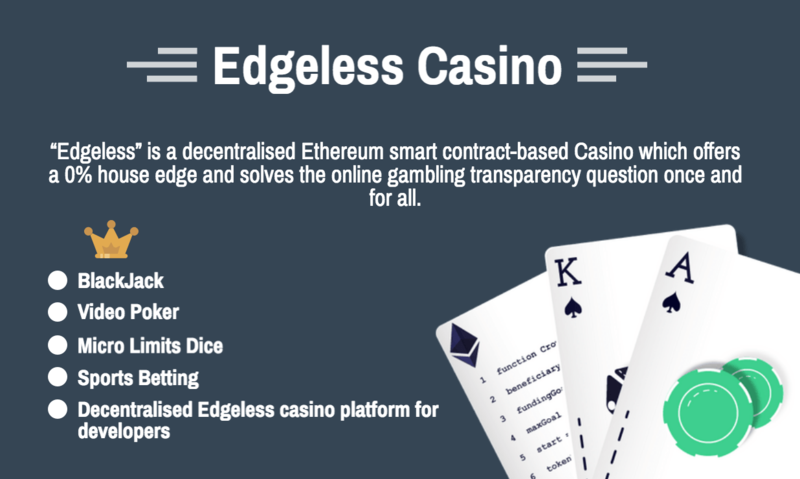 The new blockchain based casino Edgeless.io is planning to change this. “There is no way of knowing what happens inside the casino servers and how the mechanisms are programmed” says Tomas Draksas, professional gambler and co-founder of Edgeless.io, a company that promises absolute transparency and a 0% house edge casino. “Casinos can be easily rigged for a huge house edge. We want to change that by offering cryptocurrency based gambling mechanics that anyone can audit to see that we are not rigging the game and don’t have a house edge” Draksas continues. “It is scary how easily online casino can be rigged. With a few tweaks to programming code, the owners can easily influence the casino’s profitability in their own favor” states Tomas Draksas, Edgeless.io co-founder . “I believe that many major online casinos are abusing their power. For the sake of better gambling experience and industry growth, casinos must be decentralised”. “0% house edge on our games will sound really controversial for most people and that’s the reason why we offer these games. Using blockchain we can also make it extremely profitable” Says Tomas Draksas. “We also have plans for additional games and sports betting – everything will be fair and transparent, that’s our motto” he continues. Edgeless.io casino is going live in few months and before that, the company is raising funds through a new crowdfunding method called Initial Coin Offering (ICO). On the ICO, supporters can buy digital tokens that work as an in-game currency and proof of membership. Each month EDG token holders can then play a special lottery to win 40% of the company profits. “We are breaking new ground here with member benefits. Our engineers have worked hard on a Game of Profits-lottery that is open for all our token holders” says Ignas Mangevicius, CTO and co-founder of Egeless.io.